A charming corner that merits a visit, the town's compact, warm brick centro storico rides the crest of a hill above the more modern town below. Most of its best buildings date from the 16th and 17th centuries but signs of its ancient past sometimes show through. For this place was once the Roman town of Auximum. Take time to wander its inviting streets. Drop into the entrance hall of the Palazzo Comunale, or town hall, in main Piazza del Comune to see a dozen headless statues from Roman times; they once stood in the town's forum and were, according to tradition, decapitated during an early occupation of the place. The town hall itself is a fine 17th century building that boasts some interesting canvasses inside. Also hunt out the sturdy blocks that remain of the Roman walls above Via Fonte Magna and notice that the street plan of the old town still retains its Roman layout. The mosaic pavement of the Duomo is a fine relic from medieval times; the church, originally built in the 13th century in romanesque-gothic style, also has a magnificently atmospheric crypt and an outstanding bronze baptismal font from the early 17th century. The old romanesque church of San Francesco has been redone inside and out in high baroque to celebrate its later reincarnation as the sanctuary dedicated to San Giuseppe da Copertino (1603-1663). It is now an important centre of pilgrimage. San Giuseppe is known as the patron saint of those undergoing exams. Thanks also to his celebrated capacity for levitation, St Joseph of Copertino is also much invoked in the U.S.A as a protector of pilots. He was born in 1603 in Salento in Southern Italy. After overcoming failure in his studies (hence his role for students) he become a wandering Franciscan friar. 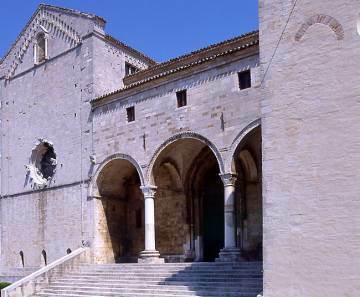 He finally settled in the friary in Osimo where he spent his last six years before dying in 1663. His remains are kept in a crystal urn in the modern crypt. You can also see the rooms, known as the camere di San Giuseppe where in religious rapture he is said to have risen from the ground. 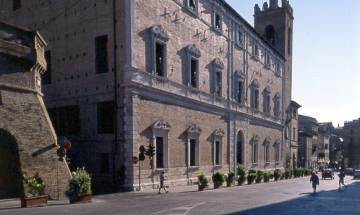 In the heart of the old centre look out for Palazzo Gallo, a splendid palace from the 16th century with an epic fresco of the Judgement of Solomon (1609) by the Tuscan painter Pomarancio. A few kilometres south-east of Osimo in the valley of the Musone river, stands the imposing Sanctuary of Campocavallo, a striking piece of early 20th century architecture in Lombard neo-gothic style. It guards a venerated image of the Virgin behind the main altar; in 1892 it was seen to weep by the faithful, a phenomenon reputedly repeated a number of times since then.